Lauren Purje (b.1987) grew up in Dublin, Ohio and graduated from Ohio University in 2009 with a BFA in Painting. She moved to Brooklyn, NY in 2011 where she currently lives and works. 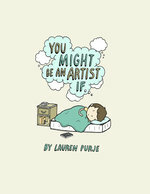 You Might Be an Artist If... drew inspiration from her own art practice and the handful of jobs she has worked in NY including an art supply store, multiple art studios, and at a Chelsea gallery. She was the first comic contributor for the art blog Hyperallergic, where the series originated and continues to be published bi-weekly.